Rare antique 19th C. Angle tube barometer marked L. Laffrancho, Ludlow circa 1825. Mahogany case with brass register scale. Reads a bit high, otherwise good working condition. Measures 33″ tall by 21″ wide. Please disregard other instruments (not included in sale) shown in photo. Please check out our other items. And be sure to add Paul Madden Antiques to your favorites list. As we are posting new items every week. If unsold after 30 days, we usually relist with a 10% to 15% price reduction so keep following! PAUL MADDEN ANTIQUES has been an active marketplace for over 40 years with 3 generations of Maddens. We offer a large inventory of Americana in great variety and have been an important source for collectors, decorators, and museums. We offer for sale American folk art, antique Nantucket Lightship baskets, Cape Cod and Islands art work, and a vast inventory marine related items. We guarantee everything we sell. 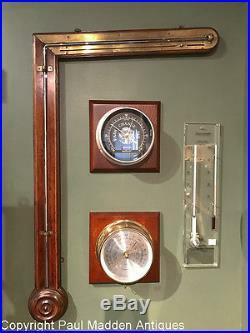 The item “Antique 19th C. Angle Tube Barometer by L. Laffrancho, Ludlow” is in sale since Monday, January 28, 2019. This item is in the category “Antiques\Science & Medicine (Pre-1930)\Scientific Instruments\Barometers”. 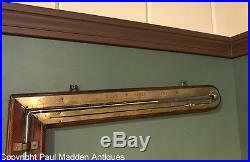 The seller is “paulmaddenantiques” and is located in Sandwich, Massachusetts. This item can be shipped to North, South, or Latin America, all countries in Europe, Japan, Australia. Filed in Uncategorized and tagged 19th, angle, antique, barometer, laffrancho, ludlow, tube.